I am as excited as a 5-year old – actually probably more so. When I picked my daughter up from school today there was a RNZAF Iroquois helicopter there and we all waited to see/hear it take off. It was awesome. I just love that sound and it was a total reprise of one of the best and most original artworks I have seen/heard this year, Michael Tuffery’s sound installation at the Wellington Railway station for the New Artland programme. You can hear about it here and see the whole episode here (#4). Who knows if it was “good art” but I liked it. It makes me wonder about evocative sounds. This week I’ve been reading about perfumes and how scent can be so evocative. Seeing and hearing the Iroquois today made me realise we associate sounds in similar ways. Many would think of Vietnam hearing that distinctive thwok-thwok-thwok of the Huey – or am I just showing my age? If you are a freak like me you might appreciate this short sound file too. I was also talking with someone this week about how living within hearing of a train whistle (or horn these days) can be a reminder that there is a larger world out there. I managed a flying visit to Pataka in Porirua today. It wasn’t meant to be so quick but I got a phone call just as I arrived about something that needed my attention back up the coast. 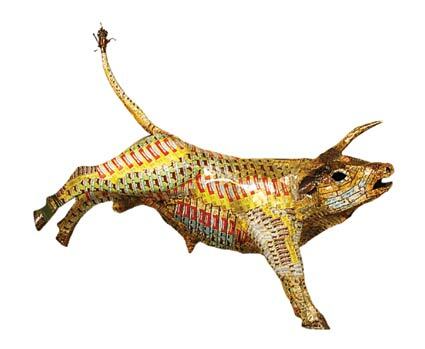 I love the name “Pataka” and think it quite fitting for a gallery, even though I don’t think they have a permanent collection as such (although they have a Tuffery Bull and several of his large wood carvings). As usual there was a lot to see. The photographs by Desiree Dolron of Cuba – Te di Todos mis Suenos (I give you all my dreams) were extremely impressive. The large format camera, long exposures, some computer ‘tweaking’ and exceptional reproduction technique resulted in images I felt I could almost walk into. The interiors were best in my opinion and captured something of the decaying past of Havana. The images on the web simply don’t do them justice. Ricky Maynard’s photography has been well described elsewhere (and with more depth than I can give). I liked the Moonbird People series. Perhaps they resonated with my own connections to the Muttonbirders of the TiTi Islands in the South of New Zealand. Of these, my favourite was a photo called “The Mission”, but again I have no language to explain why. 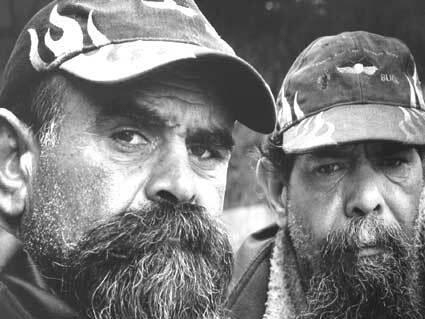 The close up portraits of the Wik elders were quite stunning too. Finally there were the drawings of Joanna Margaret Paul “Subjects to Hand” (those damn hands again). I feel I should like Paul’s work, but I found much of it insipid, although there were some striking pieces eg Untitled (rose and violet torso) c1982 which features on the cover of the accompanying book. Unfortunately I had to rush off because the highlight of my whole visit today was a circular painting by Paul – “Jerusalem” which I immediately recognised as the accommodation in the old convent up the river. The gallery area where the painting was, was titled “the colourist” (or something) and I wasn’t sure if it was part of the touring exhibition or not. I have emailed the gallery to ask for further details, but the picture it was in a similar style to Paul’s “Inventories” paintings from 1977. For me it was like peering into a familiar room “through a looking glass”. Yes – art should make you think and also get you excited and today I lucked out. House-bound due to bad weather and family illness, I managed to read some more of the Rita Angus book and wade through more of Nigel Warburton’s philosophical reply to “the Art question“. I still can’t answer “What is Art?” but I am learning a lot. I also watched the Michael Tuffery episode (#4) of New Artland. A quote from Rita Angus: An Artist’s Life. Courtney Arthur writes in the 1930s “The international situation seems hopeless…‘while we have capitalism, we will always have wars’ said Eric Gill & if only we could make the average person think – instead of having it done for them or not at all (by the newspapers, radios, talkies etc) We might be able to do something…However we can but talk & read & try to convert our fellow men” While he was talking about socialism and peace, I think it still stands for our times and something about it struck me in relation to art although I cannot pinpoint why. I am doing my bit by talking and reading but I don’t have the apolistic nature to convert anyone. This is an awesome book, immensely readable and meticulously researched. I cannot wait for the exhibition as there are so many works that are new to me. In the New Artland Episode, Michael Tuffery created an amazing soundscape installation at the Wellington Railway Station. This really excited me as sound as art is new(ish) to me and what a fantastic location for this installation. The things that have been intriguing me about art most recently also came to the fore here as the work was completely ephemeral and surprising, catching rush-hour commuters mostly unaware. I SO wish I’d been there, my computer speakers did not do it justice. Also a reader (thanks!) 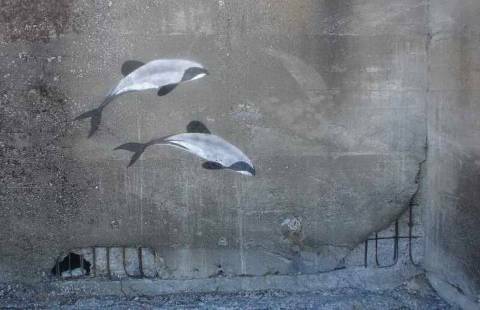 sent me this story about an artist and conservation worker who got arrested for some ‘real’ street art “Early this year, stencilled dolphins appeared on the abutments of rail overbridges on Te Weka Street and Domain Avenue, leaping gracefully on the concrete faces. A few weeks later, stencilled nets appeared — perhaps to ensure the message was clear — that fishing methods like trawling and particularly set netting are killing dolphins. The man behind the message is 24-year-old Jono More… Mr More says the overbridges were chosen as a blank canvas close to the sea, and said it was a message for the public on public – as opposed to private – property.” The artwork is beautiful and I think looks more poignant on the grey concrete than canvas. And he went to court for this! I don’t live in a cultural wilderness – really I don’t. Where I live is supposedly “arty” and there is a lot of art about but, as I was saying to someone the other day “surely mediocrity is the enemy?”. Anyway yesterday I took the road south to Porirua and the drive down the coast gave me an idea why many artists have been draw to the area, it was a beautiful clear, calm day with long views to the South Island. 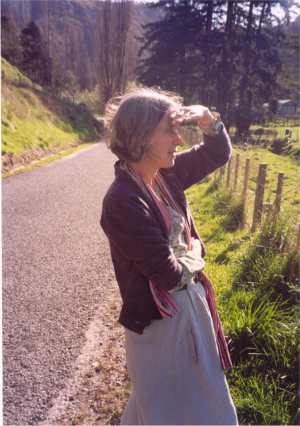 Also a few literary names that sprang to mind on the journey were JC Sturm in Paekakariki, Alistair and Meg Campbell in Pukerua Bay, Sam Hunt in Paremata. My target was Pataka in Porirua (well after I’d bought tepee making materials). I had no idea what was on so it was a pleasant surprise to see so many good things. I am no art reviewer but I can give a brief run down. “Observanceis a series of long exposure portraits and soundscapes of people in a meditative state of prayer from a wide spectrum of spiritual practices and faiths from around the world.” This was excellent and although I was a little put off by the blurriness due to the long exposures to start with, overall I think that added to the effect. There is a video to watch as well which I didn’t get to sit right through but which would be worth going back to see. One critique is that only a selection of the photos are on display. There was a small list with tiny thumbnails of the whole series near the video screen and I felt a little short changed. A humorous thing for me was one of the ‘spiritual practices’ was Jedi! There were also 2 exhibitions of prints. 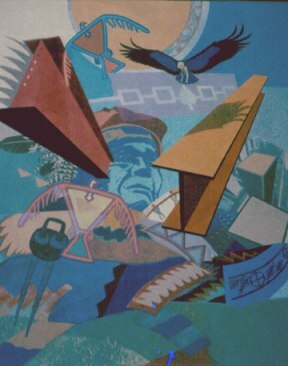 ‘Crow’s Shadow’ – Native American artists and ‘Crossing Cultures’ by Australian aboriginal artists. 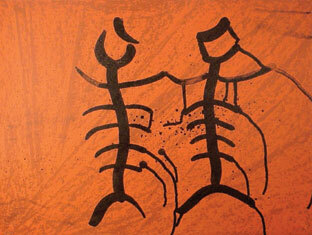 My pick of the bunch were Lillian Pitt’s pictographs from the former and D W Eastwood’s work from the latter. There was a lot to take in. Hows that for a “high-school style” review? :-) I can also recommend the gallery cafe and the oaty caramel slice. OK I had to drive 20 minutes to see that but thats nothing really. I am also very happy to report that 5mins away in our local library there is a literary event tonight – A Tribute to Hone Tuwhare. Poet Glenn Colquhoun is presenting the documentary about Hone Tuwhare’s return to his Northland home. I’ll be there.